As any soccer fan will know, passions run high when it comes to watching your team play a match. And you can multiply that by about hundred when it comes to watching your country compete at an international level, like watching them in Euro 2016. So prepare to weep heartfelt tears when you watch the video above. The 2016 UEFA European Championship will be upon us soon and this video conveys the emotion, spirit, and passion of those who adore the beautiful game. It follows a little boy as he does odd jobs—washing up, vacuuming, washing the car—and saves his pennies so he can buy a ticket to watch his team. Any sports fan will relate to it and they will also feel his pain when, after taking his savings to the ticket office the little boy is told the match has sold out. It's a heartbreaker. Disappointed the boy heads home, sullen and dejected. But it doesn't stop him from trying to see the match. Ever resourceful he tries to get a peek at the game on the TV through the windows of a local bar, before he's shooed away by the owner. His day is going from bad to worse. Now, as tragic as all this is before you start pretending you've been cutting onions, hold on, because it all works out for the young fan in the end. Not only that, but he gets to enjoying seeing his team play while also enjoying the company of other fans too. Which will only enrich his experience, because any fan knows it's far better to watch a game surrounded by the energy of people as excited as you are, then it is to watch it alone. 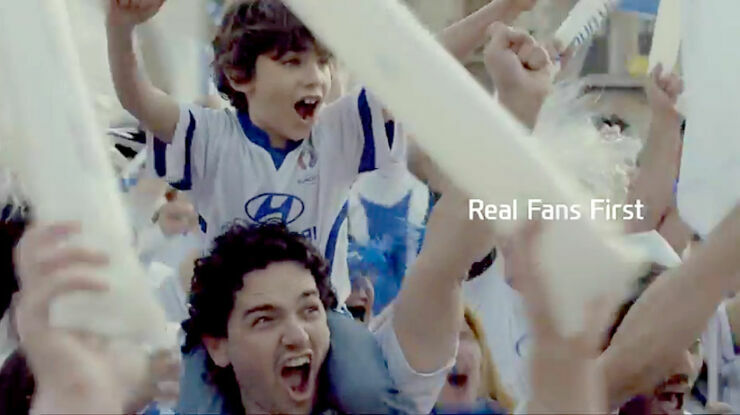 Hyundai know this too and that's why they're helping connect fans with the creation of an online fan park. Not only is it a place for fans to connect and share their love for the sport, it's also a place where they can win tickets to matches too. From now until 8 May over 200 prime seat tickets are up for grabs for the group stages of Euro 2016. All you need to do is show how passionate a fan you are.